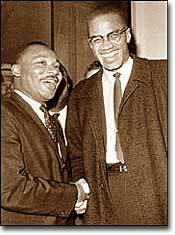 Though Martin Luther King Jr. and Malcolm X were both influential figures in the Civil Rights Movement of the 1960s, the two met only once and exchanged just a few words. When Malcolm Little was growing up in Lansing, Michigan, he developed a mistrust for white Americans. Ku Klux Klan terrorists burned his house, and his father was later murdered — an act young Malcolm attributed to local whites. After moving to Harlem, Malcolm turned to crime. Soon he was arrested and sent to jail. The prison experience was eye-opening for the young man, and he soon made some decisions that altered the course of his life. He began to read and educate himself. Influenced by other inmates, he converted to Islam. Upon his release, he was a changed man with a new identity. Believing his true lineage to be lost when his ancestors were forced into slavery, he took the last name of a variable: X.
Malcolm X was a practitioner of the Black Muslim faith, which combines the religious aspects of Islam with the ideas of both black power and black nationalism. Wallace Fard founded the Nation of Islam in the 1930s. Christianity was the white man's religion, declared Fard. 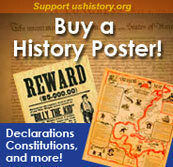 It was forced on African Americans during the slave experience. Islam was closer to African roots and identity. Members of the Nation of Islam read the Koran, worship Allah as their God, and accept Mohammed as their chief prophet. Mixed with the religious tenets of Islam were black pride and black nationalism. The followers of Fard became known as Black Muslims. When Fard mysteriously disappeared, Elijah Muhammad became the leader of the movement. The Nation of Islam attracted many followers, especially in prisons, where lost African Americans most looked for guidance. They preached adherence to a strict moral code and reliance on other African Americans. Integration was not a goal. Rather, the Nation of Islam wanted blacks to set up their own schools, churches, and support networks. When Malcolm X made his personal conversion, Elijah Muhammad soon recognized his talents and made him a leading spokesperson for the Black Muslims. Although their philosophies may have differed radically, Malcolm X believed that he and Martin Luther King Jr. were working toward the same goal and that given the state of race relations in the 1960s, both would most likely meet a fatal end. This excerpt is taken from The Autobiography of Malcolm X, which was cowritten with famed Roots author Alex Haley. The goal has always been the same, with the approaches to it as different as mine and Dr. Martin Luther King's non-violent marching, that dramatizes the brutality and the evil of the white man against defenseless blacks. And in the racial climate of this country today, it is anybody's guess which of the "extremes" in approach to the black man's problems might personally meet a fatal catastrophe first — "non-violent" Dr. King, or so-called '"violent" me. As Martin Luther King preached his gospel of peaceful change and integration in the late 1950s and early 1960s, Malcolm X delivered a different message: whites were not to be trusted. He called on African Americans to be proud of their heritage and to set up strong communities without the help of white Americans. He promoted the establishment of a separate state for African Americans in which they could rely on themselves to provide solutions to their own problems. Violence was not the only answer, but violence was justified in self-defense. Blacks should achieve what was rightfully theirs "by any means necessary." Cartoonist Jimmy Margulies's satire of police profiling — the practice of pulling motorists over simply because of their race — won him an award for excellence in journalism. Caption: "Not only does this have dynamic performance, but think of the oohs and aahs you'll get when you're pulled over on the turnpike." Malcolm X electrified urban audiences with his eloquent prose and inspirational style. 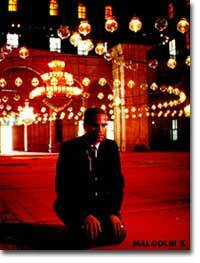 In 1963, he split with the Nation of Islam; in 1964, he made the pilgrimage to Mecca. Later that year, he showed signs of softening his stand on violence and even met with Martin Luther King Jr. to exchange remarks. What direction he might have ultimately taken is lost to a history that can never be written. As Malcolm X led a mass rally in Harlem on February 21, 1965, rival Black Muslims gunned him down. Although his life was ended, the ideas he preached lived on in the Black Power Movement. On February 27, 1946, Malcolm began serving a prison term in Charlestown, Massachusetts. There, he initiated his own reading program in the prison library. Brothermalcolm.net has a dynamic and comprehensive research site on Malcolm X for students of black studies and Black Liberation Movement activists. This very political site includes an extremely detailed chronology of Malcolm X's life, his speeches (in both text and audio format), his writings, his family history, and dozens of links. A valuable contribution to Malcolm X scholarship in the tradition of black radicalism. Here's the official site of the Nation of Islam. Elijah Muhammad's biographer, a history professor at Indiana University at Bloomington, summarizes and analyzes a 1960 speech by the leader of the Nation of Islam. The summary paints a picture of the Nation of Islam before the Civil Rights Movement really heats up; the analysis puts Muhammad's remarks into a historical and social context and serves as an excellent overview of the ideology of the Nation of Islam. The speech is available in audio format. This "official" Malcolm X site appears to be sponsored by CMG, a company that represents the families and estates of deceased celebrities. There are sections dealing with his biography, quotes, a timeline ("Highlights"), his eulogy, and a bibliography. The site doesn't quite reach its potential: although the photographs are good, the text is too sparse and visitors leave wanting more.